Jersey Boys is a 2005 jukebox musical following the successes and shortcomings of Frankie Valli and his band, The Four Seasons. Having seen the West End production roughly six years ago, most of the show was a distant memory to me. But when the lights went down on The Palace Theatre, some parts came flooding back. The show has a fairly formulaic structure, with each member of The Four Seasons taking their turn to narrate the band’s story. The nature of this, along with the emphasis on the band’s rise to fame rather than their individual lives, means that the musical seems to barely scratch the surface of the characters and their stories. To start with, I did not feel much affinity to the band, but when the songwriter and pianist Bob Gaudio came in, just like The Four Seasons, everything fell into place. Declan Egan as Gaudio was full of the energy and warmth that I thought the other characters sometimes lacked. He injected much-needed life into his narration which otherwise had a danger of feeling over-rehearsed. I was unsure what to make of Michael Watson as Frankie Valli. He didn’t strike me as having the charisma I’d usually associate with the leader of a band who left a trail of smash hits behind them. But, as the show went on, he made sense. It was ultimately his voice that prevailed, with his iconic falsetto soaring over the rest of The Four Seasons. It was a visually pleasing production with scaffold stairs and platforms filling the stage. They were used creatively, and the pop art images that were projected onto the back wall were fitting with the comic strip style of storytelling. It was – just like The Four Seasons’ perfectly synchronised dance moves and harmonies – squeaky clean. Costume and set changes were slick and faultless and often things appeared without me realising. Normally, this is what I look for in a piece of theatre but in this case, it felt at times clinical. Things almost ran too smoothly, making me very conscious that this show is a well-oiled machine that has been performed night after night for the past 14 years. The Jersey Boys is somewhat of a whistle-stop tour of The Four Seasons and, because of this, we rarely hear songs in their full length. Instead it is snippets of hits which, for the most part, serves as enough. But I wanted nothing more than to hear Frankie sing the whole of ‘My Eyes Adored You’ when his wife left him. In most musicals, songs are the way into forming emotional attachment to the characters but this structure didn’t allow for that. Despite all this, it is hard not to have the urge to sing along and smile when the iconic ‘I Can’t Take My Eyes Off You’ is finally sung in the second half. And you can see how the show inspired a generation of jukebox musicals such as Beautiful and Tina The Musical because it is, in itself, a good, polished production. Importantly, it doesn’t matter whether or not you are Frankie Valli’s biggest fan because, either way, it is a safe bet at a crowd-pleaser. 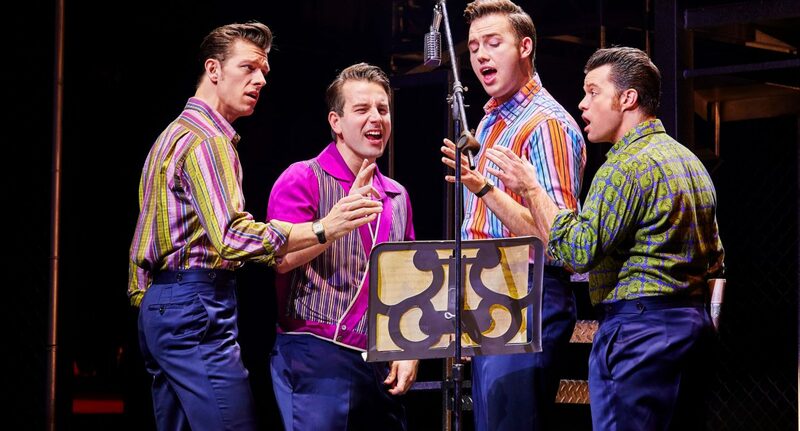 But perhaps time is not on this show’s side – the musical is now a form which is constantly being reinvented and reimagined so, at a running time of a very predictable two and a half hours, it’s hard to not feel like Jersey Boys is just painting by numbers.